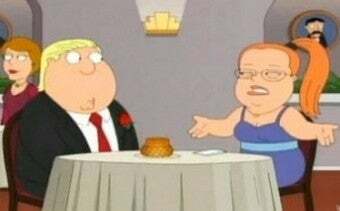 After Family Guy featured a character with Down syndrome and an obvious joke about Sarah Palin, she responded that it felt like a "kick in the gut." But is the episode actually offensive to intellectually disabled people? Out of context, it seems mostly mystifying. I wasn't crazy about Ellen's "Down syndrome" voice (assuming a non-disabled actor played the role), but> (update: Ellen's character was voiced by an actress with Down syndrome) it's certainly not a stereotype that people with Down syndrome are demanding. The dig about Ellen's mom being the former governor of Alaska just seems sort of out of place, and the entire scene appears less about disabilities than about a girl who likes to order her date around. The rest of the episode yields some more upsetting bits — notably the musical number "Down Syndrome Girl." Stewie sings a bunch of jokes about Ellen spilling Yoo-Hoo and learning to tie her shoes, all of which are tasteless. There's also the odd assertion that Ellen has a super-strong, crushing embrace. Given the fact that people with Down syndrome sometimes have poor muscle tone, this seems especially stupid: an attempt to play on stereotype without even understanding what the stereotypes are. If the writers of a particularly pathetic cartoon show thought they were being clever in mocking my brother and my family yesterday, they failed. All they proved is that they're heartless jerks. I mostly agree with Sarah and Bristol. Which, in turn, outrages me because I don't like agreeing with them. But comedic mimicry of retarded people is obnoxious. Even when it's self-aware, it's painful to watch able-minded adults ape at buffoonish caricatures of the mentally disabled-it feels too much like playground taunts from the fourth grade. Joy Behar's comment that Ellen is "feisty and assertive" rather than "pathetic" is especially spot-on. O'Connor's right that "buffoonish caricatures of the mentally disabled" are obnoxious and unfunny. And Stewie's song "Down Syndrome Girl" falls into that category. The thing is, the character of Ellen actually doesn't. The problem with her (very brief) relationship with Chris isn't that she can't tie her shoes — she seems quite competent — but that she treats him badly. Chris says, "I used to hear that people with Down syndrome were different than the rest of us, but you're not! You're not different at all!" And in fact, her character seems less a caricature of the mentally disabled than a response to the oft-repeated platitude that people with Down syndrome are sweeter or more loving than people without. By making Ellen mean and domineering, Family Guy may be making the point that people with intellectual disabilities inhabit the full range of human personality, and that we shouldn't make assumptions about them because of their chromosomes. Of course, it is Family Guy, so they have to make a lot of dumb jokes that undermine this interesting and even somewhat subversive point. And while the writers mostly portray Ellen respectfully, I wondered if they also had in mind an audience that would snicker at the very idea of a girl with Down syndrome on a date. While the upshot of the Ellen/Chris relationship is more thought-provoking than offensive, it's distinctly possible that its creators had the cheap laugh in mind the whole time too. The episode wouldn't be a great teaching tool in the fight against ableist discrimination. But like so many things, it's a lot more complicated than Sarah Palin suggests.